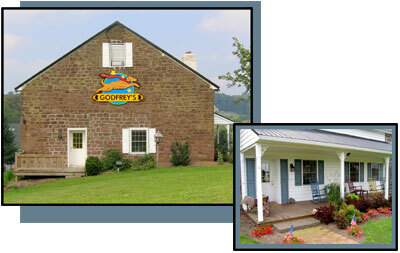 Godfrey's Dogdom, Berks County offers fine gifts for dog lovers and their dogs!!!!!! Check out TV show "Dog is Family" on local cable channel BCTV-Comcast Channel 15. The next show will be on Friday, April 26, 2019 at 12noon. Visit "DOG is Family TV" to view all past shows! Come out for some fun! 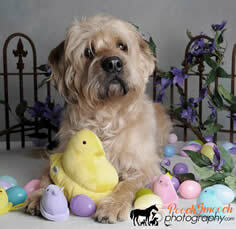 Meet our Easter Puppy "Bunny"
KPETS Therapy Dog: Prep Classes On Going! Innovative "Puppy Start Right Preschool™"-Enrollment every week! Rolling Enrollment-Start the week you and your dog are ready! No waiting! Godfrey's - Welcome to Dogdom is a very special place where you and your dog can come to shop, train, relax and play. At Godfrey’s, you’ll find handcrafted creations, jewelry, artwork, apparel, toys, natural foods, gourmet treats, outdoor adventure gear, and many other delightful surprises for you and your dog, all creatively displayed in our "house" – just as they would be found in yours! Our retail selection is strongly focused on: items made in the USA (many handcrafted by regional juried artists); international "Fair Trade" items; items that "give back" to animal causes, and items created with a strong sense of environmental responsibility. Our foods, treats, and supplements are second to none and our education and knowledge about our products will help you make better selections for your dog's life. Come visit us…share dog stories, find that special gift for yourself or others, or enjoy the country view from one of the rocking chairs on the porch. Join our play groups and run and play with your dog in our safe, fenced dog parks. Godfrey’s is truly a celebration of dogs in our lives. We live and believe in a happy canine lifestyle, where dogs are truly members of the family. We embrace our responsibility to care for their minds, bodies and spirits in the absolute best way possible. If you love dogs, you’ll love Godfrey’s…we're so much more than a canine store! Keep barking up the right tree...stay connected with us and other Godfrey's fans on Facebook! "Like us" on Facebook for Godfrey’s Discounts and Give Aways!